[ACT](VC) Limit Break 4 (This ability is active if you have four or more damage):[Counter Blast (3)] Until end of turn, this unit gets [Power]+2000 and "[CONT](VC):This unit battles every unit in your opponent's front row in one attack.". 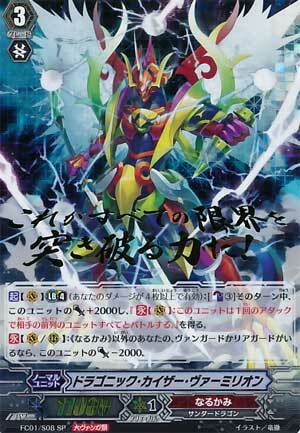 [CONT](VC/RC):If you have a non-«Narukami» vanguard or rear-guard, this unit gets [Power]-2000. ...so the original main ace of Narukami has been known as one of the more annoying cards to deal with seeing how it's one of the first ever units to attack multiple units in a single strike with it's Limit Break. That effect alone can be a game-changer or even a decider depending on the scenario. The main downside of this, however, is that you have to Counterblast 3, but that can easily be dealt with and resolved by using the Narukami's Damage Inflicter, Dragon Monk, Ginkaku as it can 1.) Provide the extra Counterblast needed to get to Limit Break and 2.) Be able to shuffle back a face-down damage to make space for a potential second Limit Break from either Kaiser Vermillion unit. Mix that in with an 11,000 natural power and you have one of the most intimidating units in the game. Next Time: ...why does it have Break in the name when it doesn't even have a Limit Break?? ?